Midwest Wheelcover and R & R Tire - FIN TYPE. Home > Type/Style > FIN TYPE. 1033, Hubcap used, 15", 70, BUICK, RIVIERA, FIN TYPE. 1037, Hubcap used, 15", 71-72, BUICK, RIVIERA, FIN TYPE. 1050, Hubcap used, 15", 73-74, BUICK, RIVIERA, FIN TYPE..
1050, Hubcap used, 15", 73-74, BUICK, RIVIERA, FIN TYPE. 1059, Hubcap used, 15", 75-76, BUICK, RIVIERA, FIN TYPE. 129, HUBCAP USED, 14", 72-78, AMC, AMBASSADOR, CONCORD, GREMLIN, HORNET, JAVELIN, MATADOR, PACER, FIN TYPE. 3028, Hubcap USED, 15", 68-74, CHEVY, PASSENGER, CORVETTE, FIN TYPE EARLY., CHROME OUTER RING, BLACK CENTER & FLAGS IN CENTER. METAL CLIPS. 303, Hubcap used, 14", 67, CHRYSLER, RWD, WITH CHRYSLER SCRIPT, FIN TYPE. 3034, HUBCAP USED, 15", 69-73, CHEVY PASSENGER, MONTE CARLO, FIN TYPE. 329, HUBCAP USED, 14", 68, PLYMOUTH, PASSENGER, FIN TYPE. 341, HUBCAP USED, 15", 69-71, DODGE PASS, 5 HOLE TYPE, CHROME OUTER RING WITH RAISED CENTER CHROME RING WITH FIN ON INNER EDGE OF RING AND THE WORDS DODGE DIVISION IN RAISED CHROME, RED RING AND NOT LOGO IN BLACK CENTER OF RED RING. SAW TOOTH CLIPS. 344, HUBCAP USED, 14", 69, PLYMOUTH, BARRACUDA, VALIANT, PASSENGER, FIN TYPE. 4009, Used Rims,16X6-1/2, 5 LUG, 115mm, 92-99, BUICK, LESABRE, PARK AVE, ALUM FIN TYPE. 4009, Used Rims, 16X6-1/2, 5 LUG, 115mm, 92-99, BUICK, LESABRE, PARK AVE, ALUM FIN TYPE. 4025, Hubcap, 14", 71, OLDSMOBILE, F85, POLISHED OUTER RING, FIN TYPE, MACHINED CENTER. ENGRAVED LOGO PAINTED BLACK, METAL CLIPS. 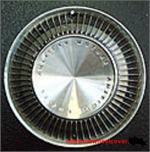 4025, Hubcap, 14", 71, OLDSMOBILE, F85, POLISHED OUTER RING, FIN TYPE WITH MACHINED CENTER. WITH ENGRAVED LOGO PAINTED BLACK, METAL CLIPS. 414d, Hubcap used, 15", 80-81, DODGE, DIPLOMAT, ST REGIS, PASSENGER, FIN TYPE, WITH DODGE CREST. 414e, Hubcap used, 15", 80-81, CHRYSLER, LE BARON, FIN TYPE, LE BARON EMBLEM (BIRD LOGO). 5047a, HUBCAP USED, 15", 77-79, PONTIAC, GRAND PRIX, LE MANS, PASSENGER, SILVER FIN TYPE, POLISHED OUTER RING, SILVER FINS, CHROME HEX CENTER, RED LOGO, METAL CLIPS. 5051a, Hubcap used, 14", 78-79, PONTIAC, GRAND PRIX, CONCAVE DESIGN, FIN TYPE, POLISHED OUTER RING, RIBBED FACE, HEX CENTER, GP LOGO, METAL CLIPS. 648, Hubcap used, 15", 68-69, LINCOLN, MARK SERIES, FIN TYPE, LINCOLN LOGO. 669, Hubcap used, 14", 70, MERCURY, COUGAR XR-7, FIN TYPE, XR-7 EMBLEM.